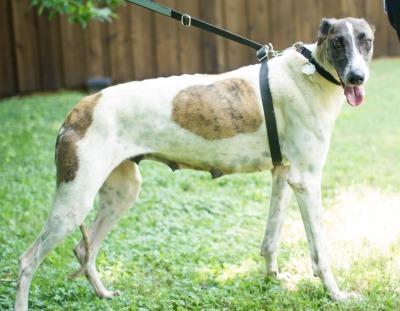 Lady Bird is estimated to be a three year old brindle and white female greyhound. Lady Bird arrived with George, Laura, Lyndon, Classy, Etta and Butch from a horrific cruelty seizure in West Texas. She is in stable condition and has had multiple litters of puppies – the most recent including Etta and Butch that we know of. She has a fairly high positive titer to Ehrlichia Canis, is heartworm negative and is carrying a large load of intestinal parasites, for which she is being treated. Lady Bird’s weight at this time is 58 pounds. Lady Bird has been successfully treated for Ehrlichia Canis and has a negative PCR test. 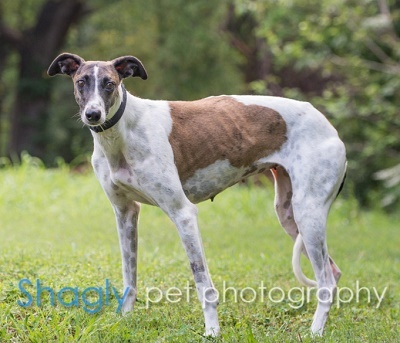 She has completed all of her medical procedures and is ready to find her forever home! The special medical treatment cost needed by Lady Bird is why the Miss Mesa Fund was established. If you would like to help with Lady Bird's care, please take a moment to make a donation to the fund. 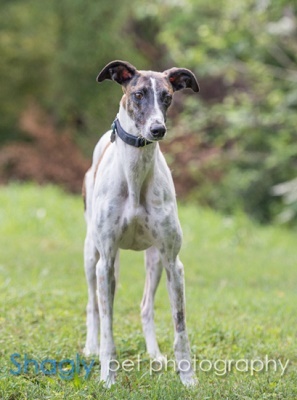 You WILL and CAN make a difference in Lady Bird's life and the lives of other greyhounds in need of special medical care. Your help and support will make a difference - one greyhound at a time. Please note 2016 Grant Challenge/Lady Bird on your check.